A captain is actually a complex and dynamic supply and demand network. Replica of an East Indiaman of the Dutch East India Company/United East India Company (VOC). In terms of production and trade of spices, the VOC was a pioneering model of the global supply chain in early modern period. In business and finance, supply chain is a system of organizations, people, activities, information, and resources involved in moving a product or service from supplier to customer. Supply chain activities involve the transformation of natural resources, raw materials, and components into a finished product that is delivered to the end customer. In sophisticated supply chain systems, used products may re-enter the supply chain at any point where residual value is recyclable. Supply chains link value chains. Supply Chain Management encompasses the planning and management of all activities involved in sourcing and procurement, conversion, and all logistics management activities. Importantly, it also includes coordination and collaboration with channel partners, which can be suppliers, intermediaries, third-party service providers, and customers. In essence, supply chain management integrates supply and demand management within and across companies. Supply Chain Management is an integrating function with primary responsibility for linking major business functions and business processes within and across companies into a cohesive and high-performing business model. It includes all of the logistics management activities noted above, as well as manufacturing operations, and it drives coordination of processes and activities with and across marketing, sales, product design, finance, and information technology. Many of the exchanges encountered in the supply chain are therefore between different companies that seek to maximize their revenue within their sphere of interest but may have little or no knowledge or interest in the remaining players in the supply chain. More recently, the loosely coupled, self-organizing network of businesses that cooperates to provide product and service offerings has been called the extended enterprise. As part of their efforts to demonstrate ethical practices, many large companies and global brands are integrating codes of conduct and guidelines into their corporate cultures and management systems. Through these, corporations are making demands on their suppliers (facilities, farms, subcontracted services such as cleaning, canteen, security etc.) and verifying, through social audits, that they are complying with the required standard. A lack of transparency in the supply chain is known as mystification, which bars consumers from the knowledge of where their purchases originated and can enable socially irresponsible practices. Supply-chain managers are under constant scrutiny to secure the best pricing for their resources, which becomes a difficult task when faced with the inherent lack of transparency. Cost benchmarking is one effective method for identifying competitive pricing within the industry. This gives negotiators a solid basis to form their strategy on and drive overall spend down. A diagram of a supply chain. The black arrow represents the flow of materials and information, and the gray arrow represents the flow of information and backhauls. The elements are (a) the initial supplier (vendor or plant), (b) a supplier, (c) a manufacturer (production), (d) a customer, and (e) the final customer. There are a variety of supply-chain models, which address both the upstream and downstream elements of supply-chain management (SCM). The SCOR (Supply-Chain Operations Reference) model, developed by a consortium of industry and the non-profit Supply Chain Council (now part of APICS) became the cross-industry de facto standard defining the scope of supply-chain management. SCOR measures total supply-chain performance. It is a process reference model for supply-chain management, spanning from the supplier's supplier to the customer's customer. It includes delivery and order fulfillment performance, production flexibility, warranty and returns processing costs, inventory and asset turns, and other factors in evaluating the overall effective performance of a supply chain. The Global Supply Chain Forum has introduced another supply chain model. This framework is built on eight key business processes that are both cross-functional and cross-firm in nature. Each process is managed by a cross-functional team including representatives from logistics, production, purchasing, finance, marketing, and research and development. While each process interfaces with key customers and suppliers, the processes of customer relationship management and supplier relationship management form the critical linkages in the supply chain. The American Productivity and Quality Center (APQC) Process Classification Framework (PCF) SM is a high-level, industry-neutral enterprise process model that allows organizations to see their business processes from a cross-industry viewpoint. The PCF was developed by APQC and its member organizations as an open standard to facilitate improvement through process management and benchmarking, regardless of industry, size, or geography. The PCF organizes operating and management processes into 12 enterprise-level categories, including process groups, and over 1,000 processes and associated activities. In the developing country public health setting, John Snow, Inc. has developed the JSI Framework for Integrated Supply Chain Management in Public Health, which draws from commercial sector best practices to solve problems in public health supply chains. 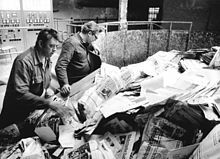 A German paper factory receives its daily supply of 75 tons of recyclable paper as its raw material. In the 1980s, the term supply-chain management (SCM) was developed to express the need to integrate the key business processes, from end user through original suppliers. Original suppliers are those that provide products, services, and information that add value for customers and other stakeholders. The basic idea behind SCM is that companies and corporations involve themselves in a supply chain by exchanging information about market fluctuations and production capabilities. Keith Oliver, a consultant at Booz Allen Hamilton, is credited with the term's invention after using it in an interview for the Financial Times in 1982. The term was used earlier by Alizamir et al. in 1981 . If all relevant information is accessible to any relevant company, every company in the supply chain has the ability to help optimize the entire supply chain rather than to sub-optimize based on local interest. This will lead to better-planned overall production and distribution, which can cut costs and give a more attractive final product, leading to better sales and better overall results for the companies involved. This is one form of vertical integration. Incorporating SCM successfully leads to a new kind of competition on the global market, where competition is no longer of the company-versus-company form but rather takes on a supply-chain-versus-supply-chain form. The primary objective of SCM is to fulfill customer demands through the most efficient use of resources, including distribution capacity, inventory, and labor. In theory, a supply chain seeks to match demand with supply and do so with minimal inventory. Various aspects of optimizing the supply chain include liaising with suppliers to eliminate bottlenecks; sourcing strategically to strike a balance between lowest material cost and transportation, implementing just-in-time techniques to optimize manufacturing flow; maintaining the right mix and location of factories and warehouses to serve customer markets; and using location allocation, vehicle routing analysis, dynamic programming, and traditional logistics optimization to maximize the efficiency of distribution. The term "logistics" applies to activities within one company or organization involving product distribution, whereas "supply chain" additionally encompasses manufacturing and procurement, and therefore has a much broader focus as it involves multiple enterprises (including suppliers, manufacturers, and retailers) working together to meet a customer need for a product or service. Starting in the 1990s, several companies chose to outsource the logistics aspect of supply-chain management by partnering with a third-party logistics provider (3PL). Companies also outsource production to contract manufacturers. Technology companies have risen to meet the demand to help manage these complex systems. There are four common supply-chain models. Besides the three mentioned above, there is the Supply Chain Best Practices Framework. In recent studies, resilience, as "the ability of a supply chain to cope with change", is regarded as the next phase in the evolution of traditional, place-centric enterprise structures to highly virtualized, customer-centric structures that enable people to work anytime, anywhere. A resilient supply network should align its strategy and operations to adapt to risk that affects its capacities. Supply chain resilience is improved by collaboration across the network, supporting faster adaptation to supply changes. It is not about responding to a one-time crisis, or just having a flexible supply chain. It is about continuously anticipating and adjusting to discontinuities that can permanently impair the value proposition of a core business with special focus on delivering customer satisfaction. Strategic resilience requires continuous innovation with respect to product structures, processes, but also corporate behavior. Recent research suggests that supply chains can also contribute to firm resilience. On the Internet, customers can directly contact the distributors. This has reduced the length of the chain to some extent by cutting down on middlemen. Some of the benefits are cost reduction and greater collaboration. Incidents like the 2013 Savar building collapse with more than 1,100 victims have led to widespread discussions about corporate social responsibility across global supply chains. Wieland and Handfield (2013) suggest that companies need to audit products and suppliers and that supplier auditing needs to go beyond direct relationships with first-tier suppliers. They also demonstrate that visibility needs to be improved if the supply cannot be directly controlled and that smart and electronic technologies play a key role to improve visibility. Finally, they highlight that collaboration with local partners, across the industry and with universities is crucial to successfully manage social responsibility in supply chains. Many agribusinesses and food processors source raw materials from smallholder farmers. This is particularly true in certain sectors, such as coffee, cocoa and sugar. Over the past 20 years[when? ], there has been a shift towards more traceable supply chains. Rather than purchasing crops that have passed through several layers of collectors, firms are now sourcing directly from farmers or trusted aggregators. The drivers for this change include concerns about food safety, child labor and environmental sustainability as well as a desire to increase productivity and improve crop quality. Supply-chain security has become particularly important in recent years.[when?] As a result, supply chains are often subject to global and local regulations. In the United States, several major regulations emerged in 2010 that have had a lasting impact on how global supply chains operate. These new regulations include the Importer Security Filing (ISF) and additional provisions of the Certified Cargo Screening Program. With increasing globalization and easier access to alternative products in today's markets, the importance of product design to generating demand is more significant than ever. In addition, as supply, and therefore competition, among companies for the limited market demand increases and as pricing and other marketing elements become less distinguishing factors, product design likewise plays a different role by providing attractive features to generate demand. In this context, demand generation is used to define how attractive a product design is in terms of creating demand. In other words, it is the ability of a product's design to generate demand by satisfying customer expectations. But product design affects not only demand generation but also manufacturing processes, cost, quality, and lead time. The product design affects the associated supply chain and its requirements directly, including manufacturing, transportation, quality, quantity, production schedule, material selection, production technologies, production policies, regulations, and laws. Broadly, the success of the supply chain depends on the product design and the capabilities of the supply chain, but the reverse is also true: the success of the product depends on the supply chain that produces it. Since the product design dictates multiple requirements on the supply chain, as mentioned previously, then once a product design is completed, it drives the structure of the supply chain, limiting the flexibility of engineers to generate and evaluate different (and potentially more cost-effective) supply-chain alternatives. ^ cf. Wieland, Andreas; Wallenburg, Carl Marcus (2011). Supply-Chain-Management in stürmischen Zeiten (in German). Berlin: Universitätsverlag der TU. ISBN 978-3-7983-2304-9. ^ Grenville, Stephen (3 November 2017). "The first global supply chain". Lowy Institute. Retrieved 18 May 2018. ^ Kozlenkova, Irina; et al. (2015). "Journal of Retailing". Journal of Retailing. 91 (4): 586–609. doi:10.1016/j.jretai.2015.03.003. Retrieved 28 September 2016. ^ Nagurney, Anna (2006). Supply Chain Network Economics: Dynamics of Prices, Flows, and Profits. Cheltenham, UK: Edward Elgar. ISBN 978-1-84542-916-4. ^ Inc., Advanced Solutions International. "Home". cscmp.org. Retrieved 22 January 2018. ^ "Supply Chain Council, SCOR Model". ^ "SCM Institute". scm-institute.org. Retrieved 22 January 2018. ^ "Getting Products to People: The JSI Framework for Integrated Supply Chain Management in Public Health". ^ Oliver, R. K.; Webber, M. D. (1992) . "Supply-chain management: logistics catches up with strategy". In Christopher, M. (ed.). Logistics: The Strategic Issues. London: Chapman Hall. pp. 63–75. ISBN 978-0-412-41550-0. ^ Jacoby, David (2009). Guide to Supply Chain Management: How Getting it Right Boosts Corporate Performance. The Economist Books (1st ed.). Bloomberg Press. ISBN 978-1-57660-345-1. ^ Blanchard, David (2010). Supply Chain Management Best Practices (2nd ed.). John Wiley & Sons. ISBN 978-0-470-53188-4. ^ Alizamir, S., Alptekinoglu, A., & Sapra, A. (1981). Demand management using responsive pricing and product variety in the presence of supply chain disruptions: Working paper, SMU Cox School of Business. ^ "eShipGlobal - Ship. Connect. Deliver". eShipGlobal. Retrieved 22 January 2018. ^ Wieland, A. & Wallenburg, C.M. (2013): The influence of relational competencies on supply chain resilience: a relational view. International Journal of Physical Distribution & Logistics Management. Vol. 43, No. 4, pp. 300-320. ^ Bell, M. A. (2002). "The Five Principles of Organizational Resilience". Gartner, Inc.
^ "Supply Chain Strategy Development" Retrieved 2014-3-25. ^ "The Four Levels of Supply Chain Maturity". 27 August 2013. Retrieved 22 January 2018. ^ Todo, Yasuyuki; Nakajima, Kentaro; Matous, Petr (2015). "How do Supply Chain Networks Affect the Resilience of Firms to Natural Disasters? Evidence from the Great East Japan Earthquake". Journal of Regional Science. 55 (2): 209–229. doi:10.1111/jors.12119. ^ "What Is the Role of the Internet in Supply-Chain Management in B2B?". Retrieved 2017-08-24. ^ Wieland, Andreas; Handfield, Robert B. (2013). "The Socially Responsible Supply Chain: An Imperative for Global Corporations". Supply Chain Management Review. 17 (5). ^ International Finance Corporation (2013), Working with Smallholders: A Handbook for Firms Building Sustainable Supply Chains (online). ^ Gokhan, Nuri Mehmet; Needy, Norman (December 2010). "Development of a Simultaneous Design for Supply Chain Process for the Optimization of the Product Design and Supply Chain Configuration Problem". Engineering Management Journal. 22 (4): 20–30. doi:10.1080/10429247.2010.11431876. Look up supply chain in Wiktionary, the free dictionary. Wikimedia Commons has media related to Supply chain.